If you visit Switzerland, Lucerne should be on your Switzerland itinerary – and there are many reasons why. I visit Lucerne regularly, and so I have compiled a list about the very best things to do in Lucerne and the 10 top things to see – plus some very important travel information for your trip. 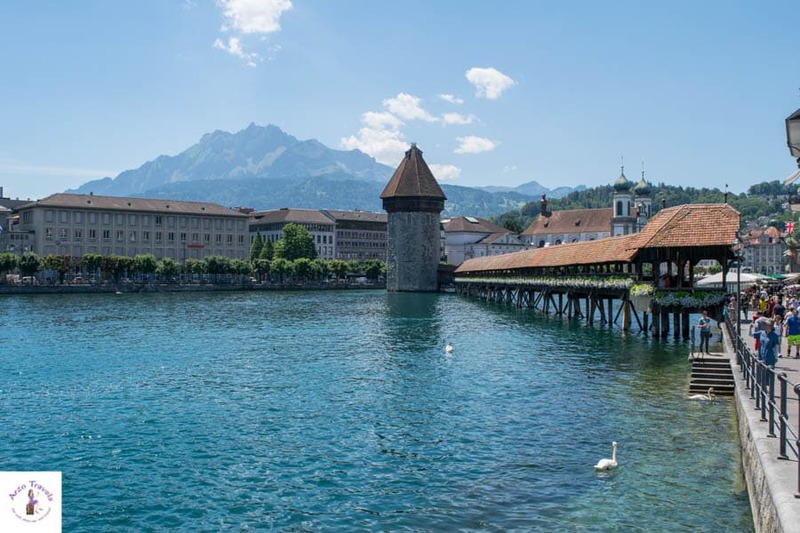 So, if you are wondering what to do in Lucerne and about a great Lucerne itinerary (for 1, 2 or 3 days) this post will help you find out about all this. Switzerland is just a magical country with fairytale villages and towns, stunning mountains, pristine lakes, and beautiful cities. I could name a million reasons why Switzerland is amazing (and even a few arguments why it is not) but this post is only about the region of Lucerne. Often, I hear that Lucerne is the most beautiful city in Switzerland. Though I do not fully agree (find out about a place that is even more gorgeous than Lucerne), I think the region of Lucerne is still somehow beyond amazing. Lets’ focus on the best places to visit in Lucerne (also known as Luzern in Switzerland), where to go and what to do. Scroll down to the bottom to find out more about important travel info for Lucerne (where to stay in Lucerne, where to eat, and how to get around). 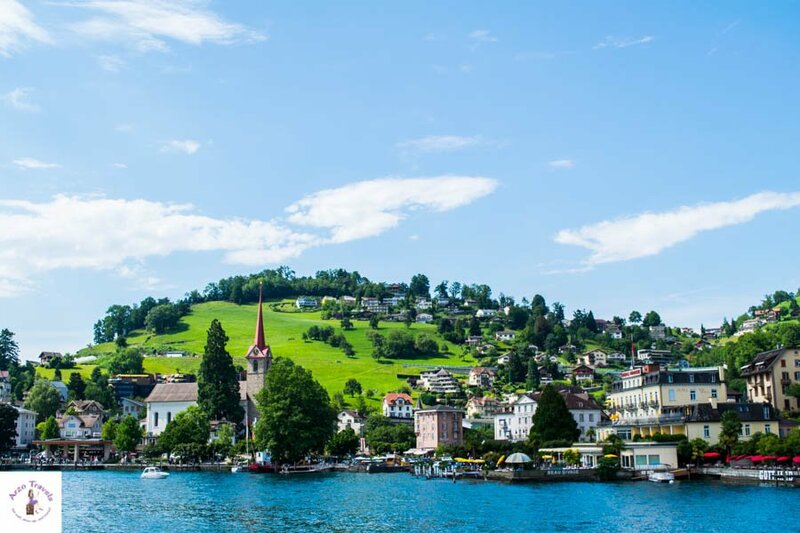 Whether you travel to Lucerne for one day, two days or three days (one day in Lucerne is probably too short to find the most beautiful places in Lucerne), using this Lucerne itinerary to find the best places in Lucerne. Most people head to the Chapel Bridge first – and I actually recommend doing so, too. The Chapel Bridge is THE most famous tourist sight in Lucerne and one of the main points of interest in Lucerne. 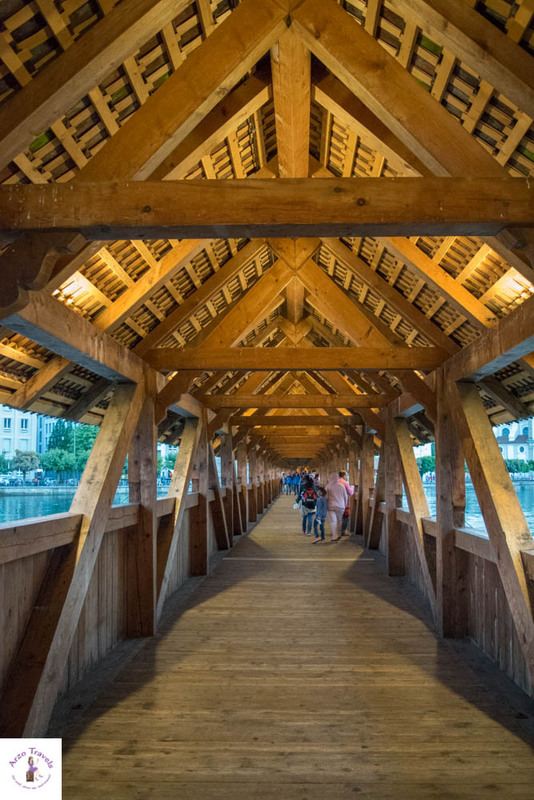 The wooden bridge, constructed in the 14th century, that once partly burnt down and was rebuilt again, is a magnet for tourists, and with a convenient location, just a stone‘s throw from the Lucerne train station, easy to reach. No wonder it is one of the first spots tourists normally visit when in Lucerne. I love the bridge at daytime, but even more at night time when the lights go on – you have not done real Lucerne sightseeing if you have not been at the bridge. To me, it t just looks so different than the rest of Lucerne, and being on the bridge looking at the alps feels quite unrealistic. Okay, there is another, smaller but similar bridge close by, but Chapel Bridge is still my favorite Lucerne attraction. On the bridge, you just have to look to the side to see the many restaurants lined up – nice places to have coffee or lunch/dinner, though Lucerne is very pricey in expensive Switzerland. If you are on the bridge, you see the Vierwaldstättersee (Lake Lucerne), which is one of the most beautiful lakes in Switzerland and have a great view of the alps as well. This is probably also the most romantic place in Lucerne for lovebirds (Have I mentioned, that I think Lucerne is probably one of the most romantic places in Switzerland?). Are you looking for more popular Lucerne attractions? Then head to the Lion Monument. So, since you are in Lucerne, you could go for a stroll through the old town and visit the second most famous sight (and the only other sight besides the bridge) – the Lion Monument which is one of the most popular sights in Lucerne. 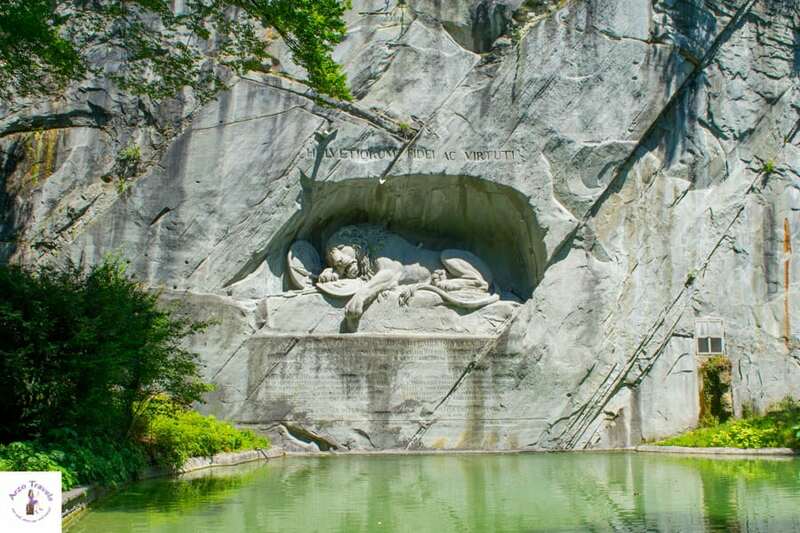 The Lion Monument is about a 10-minutes walk from the Chapel Bridge and commemorates Swiss soldiers who died in the 18th century, during the French revolution. If you prefer guided walking tours (so to make sure not to miss one thing) check out the best prices for guided tours in Lucerne. The old town is a typical Swiss old town – it is lovely, though I cannot say it is the most beautiful old town in Switzerland. With the convenient location to the lake and the Chapel Bridge, you cannot miss it and it is a great place to shop- especially luxury watches. If you do a self-guided walking tour, you should also visit the Town Hall, and along the way, you´ll pass some pretty buildings with interesting facades. However, half a day in Lucerne is enough to have seen most of the city center. Apparently, there are several museums in Lucerne, but I admit that I mostly skip museums (unless it is history or politics). If you are into museums, you could check them out or be prepared to discover more of the surroundings, which captivated me from the first second. Another thing to do in Lucerne is to walk along the promenade in Lucerne. The promenade in the city center is very busy and also quite lively most of the time, making Lucerne look bigger than it actually is. One of the things I enjoy the most when in Lucerne. If you are a fast traveler, you can add a few things for your first day. If you prefer a more relaxed way of traveling then above mentioned places make a first great day in Lucerne. Here are a few more things to see in Lucerne. 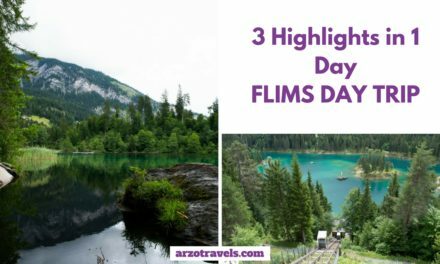 For day 2, I have a bit of chilling for your Lucerne itinerary..
What always makes me stand in awe is the fact that Switzerland´s cities are just surrounded by the most beautiful nature – and so is Lucerne. While the old town is cute, it is nature that fascinates me in Lucerne. 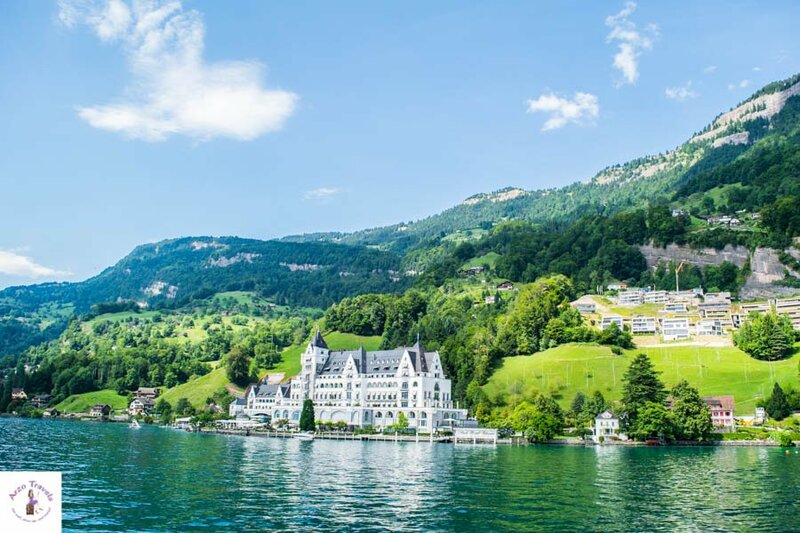 Cruising Lake Lucerne proves that it is rightly called one of the most beautiful places in Switzerland. Okay, I admit my passion for boat cruises might not be normal – some would say, it is ridiculous. BUT, Lake Lucerne is actually really pretty. 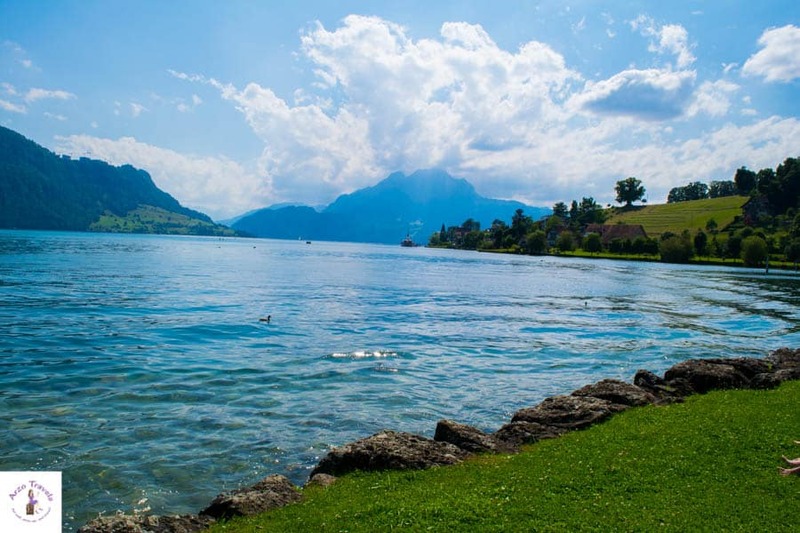 One of the best things to do in Lucerne is to spend time on Lake Lucerne (Vierwaldstättersee). 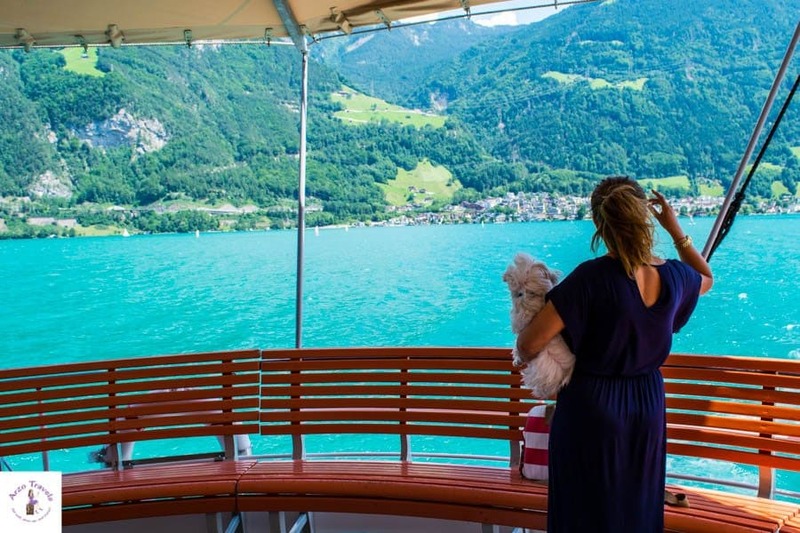 The color is not as perfect (but still just gorgeous) as it is with other lakes in Switzerland (I am very spoiled) but a boat cruise should be on your list because this huge lake is surrounded by beautiful scenery. The boat station is next to the train station in Lucerne. You can do different kinds of tours but I recommend getting a day pass, so you can get out at Weggis boat station (why getting out here? Keep reading and you´ll find out :). If you prefer a panorama sightseeing boat tour in Lucerne make sure to check out the best prices. P.S. 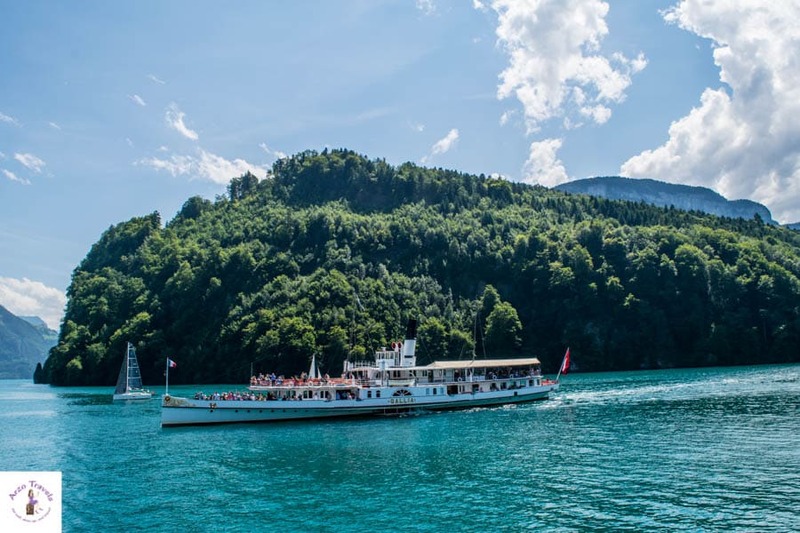 If you have a Swiss Travel Pass you can use almost all boats in Switzerland – also the boats on Lake Lucerne – without any extra surcharge. Click here to find out more about the Swiss Travel Pass. Now, after the sightseeing tour has ended, it is time to relax! And if you ask me, the best place to relax in Lucerne is at/in Weggis – it is very cute…yes, I am not sure if it is a village or just whatever, but it is tiny and if you get off the boat (or drive there by car), you can just stroll there and relax. It is one of the most beautiful places in Lucerne – quiet and pure nature. There is a lido and for a small entry fee, you can swim in Lake Lucerne (which is very clear), BUT if you ask me, skip the lido and keep walking (or driving) another kilometer or so and you find the best place to swim in Lake Lucerne. At the very end of Hertensteinstrasse is a beautiful meadow, including some restrooms, where you can lay down and chill – go swimming, get a tanned, or whatever, and you do not even have to pay for it. But, regardless of the entrance fee, I love that place because it is a hidden gem, and since a friend and I discovered it a few years ago, we always come back there (dogs are allowed). Even on a beautiful sunny day, I have never experienced it crowded! Switzerland is one of the best countries to road trip and the region of Lucerne is perfect for driving. If you still have some energy left after your time at the lake, and if you have a car, you can just drive around Lake Lucerne. 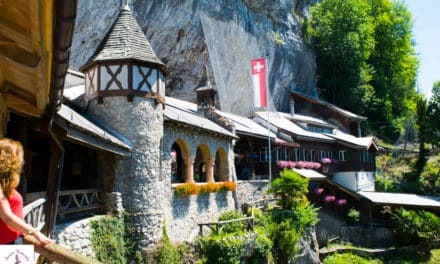 The drive from Weggis to Vitznau – and back to Lucerne – is one of the most scenic drives in Switzerland and so it is not a surprise that it is also part of the Grand Tour of Switzerland. The Axenstrasse (picture taken from a boat) is another great street to drive along – I even walked the street once (don´t ask me why) and the views are just incredible. Plan in some time so you can stop and soak in great views. If you ask me: road tripping in Lucerne is one of the very very very best things to do. 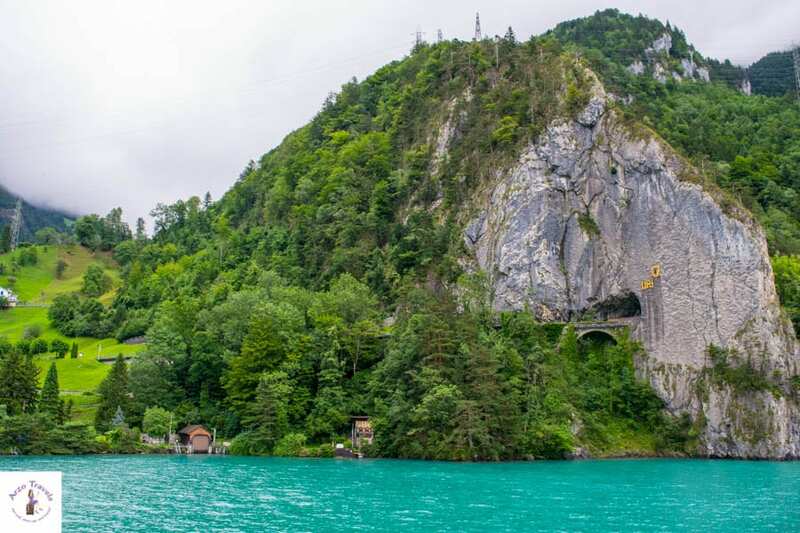 If you have a day pass for the boat, you can get to Flüelen, which is on the other end of Lake Lucerne, and enjoy more boat riding. If the weather is good, this will be like time in heaven. Cannot get enough of Lucerne? 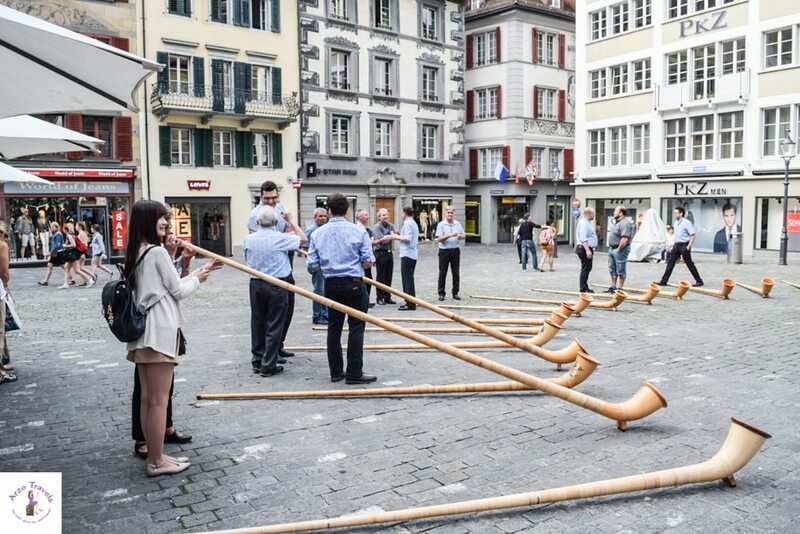 Understandable, so here are more activities in Lucerne. Okay, I would reserve at least one full day for a trip to the mountains. Lucerne has two great mountains, which are worth a visit and these are Mount Rigi and Mount Pilatus. Which is the better place to visit? Mount Rigi or Mount Pilatus? I visited both (which, conveniently, were included in my Swiss Travel Pass) and think, both are great places to visit in Lucerne. You can get up both mountains without even hiking (which is probably the best part about it), but they are completely different. First of all, I should probably admit that I visited Mount Rigi twice – once on a very foggy and rainy day (back then, I also had a Swiss Travel Pass and a trip to Mount Pilatus was included in the price- it is not anymore unfortunately) and I admit that it was quite disappointing. Unfortunately, the weather is not what it used to be, so even Switzerland´s summers can feel like a rainy fall. So, if you get up and do not have the Swiss Travel Pass, you might be disappointed if you visit on a rainy, and especially foggy, day. This is probably also true for Mount Pilatus. If you make your travel plans, choose the sunniest day for getting up on one of the mountains – both mountain views are amongst the best in all of Switzerland. 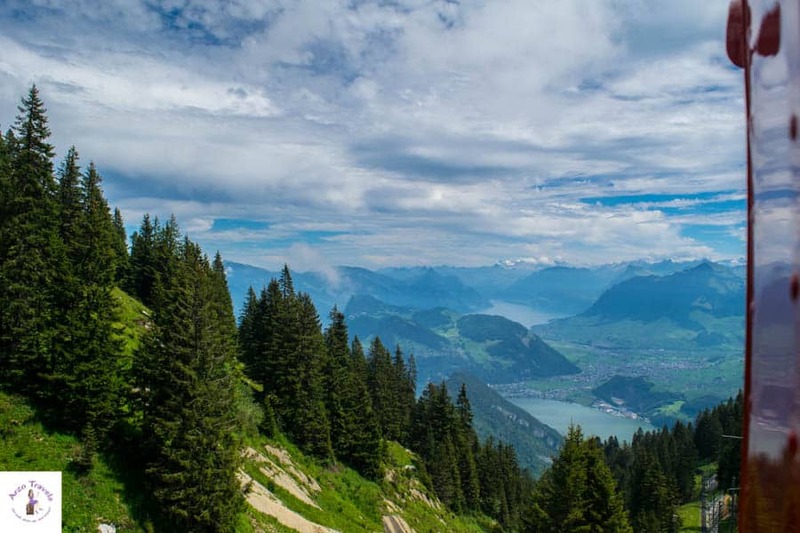 What is the difference between Mount Rigi and Mount Pilatus? As already mentioned, both mountains are huge (literally). I recommend visiting Mount Rigi if you have less time. Activities on Mount Rigi are, unlike Mount Pilatus, a bit limited and getting up Mount Rigi takes less time. Assuming you do not hike up (which, actually, is a big thing in Switzerland 🙂 ), Mount Pilatus is just so overwhelming that you, under no circumstances, should rush through because there is tooooons to do up there. Mount Pilatus is located quite close to the Lucerne city center but on a busy day, you might have to wait in line to catch a cogwheel train to get up. If you like to get up faster you can also use the cable car to reach the summit – or you can just hike. Either way, I definitely recommend visiting Mount Pilatus when in Lucerne. Mount Pilatus is like a village on a mountain – though, this is not a fact, but just my own conclusion. It takes much longer to get up there, there are much more activities to do, and more restaurants and cafes at which to sit down. Everything is just so special up there that you should plan one full day. I will have to write an extra post on my experiences, as I had an awesome time (disclosure: the weather was amazing on the day of my trip, not too hot, but great and clear, so I had the best views). Prices depend on how you get to Mount Pilatus (choosing to arrive at the station by boat costs more) and which way you use, to get up (in case you have a Swiss Travel Pass you don’t have to pay for the boat tour). P.S. If you like to have a fancy private Mount Pilatus Tour check out this link. Mount Rigi makes a great half-day trip- especially if you come here on a clear day, you can experience the most amazing sunset. 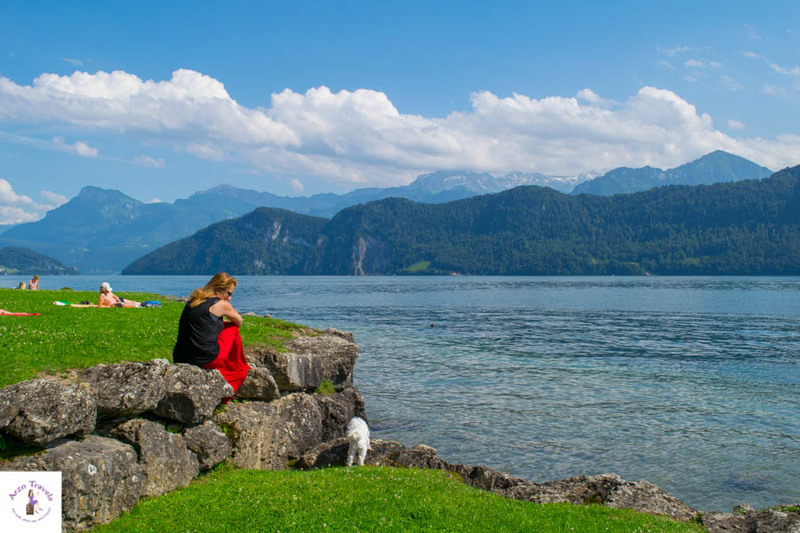 Stunning views of Lake Lucerne are just a beautiful reward. Up there are restaurants and great views to enjoy – there is even a hotel and a spa, and above all, the views are INCREDIBLE. 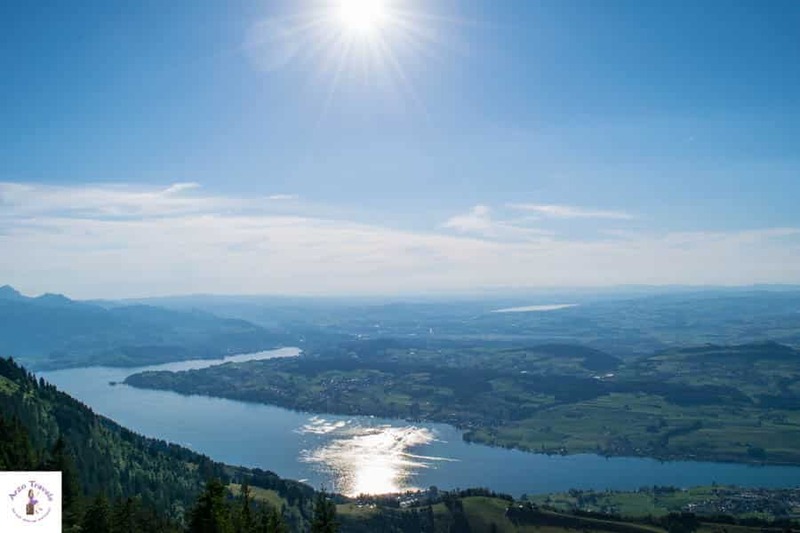 If you opt out of Mount Rigi and have some time left, you can always hike some parts – the funicular stops along the way, so you do not have to hike all the way, but can just take a shorter hike. Mount Rigi is definitely a top attraction in Lucerne and I cannot wait to visit Mount Rigi again. You need to get to Vihznau station, you can also get there by bus or drive there by car and park your car in a parking house for about 5€ for 4 hours parking(though there are several options to do so) and it takes about 30 minutes to get up there – on a clear day, the ride up is already worth it. There is another option to get up but this is probably the most scenic one to get up. If you are staying more than 2 days in Lucerne (and the budget allows you to do so), I would definitely recommend doing both mountain trips, because each mountain has its own charm and they are easily accessible (admittedly it is not a bargain to get up if you do not hike). 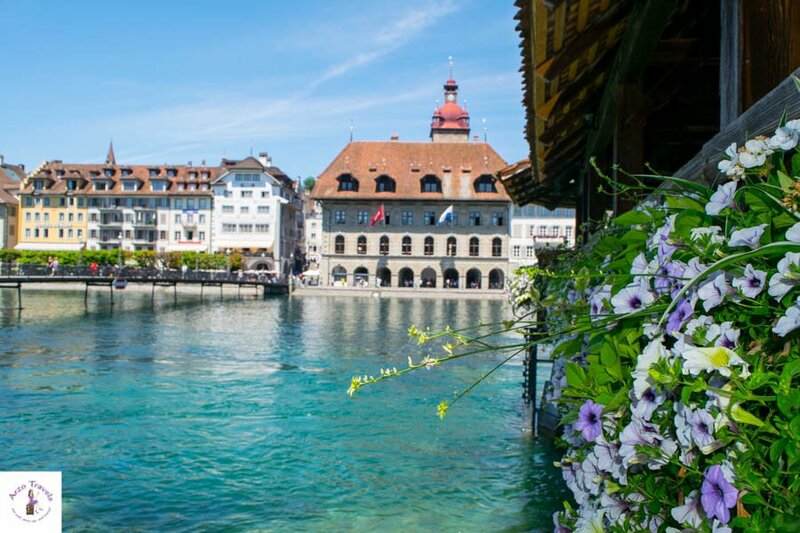 If you are staying even longer, I would recommend doing trips to Interlaken or Zurich, which are my favorite areas in fascinating Switzerland. 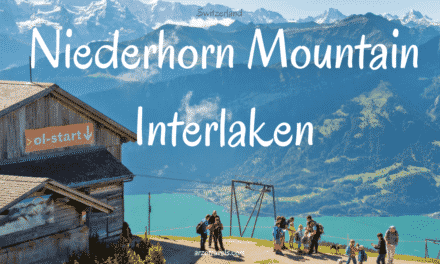 Click here to find out about the best things to do in Zurich or if you plan a trip to Interlaken click here. There are more great Lucerne points of interest but I think, these are the top places to see in Lucerne in 3 days. If you are looking for a few extra things to do in Lucerne you´ll find my tops tips below. After finding out about the best spots in Lucerne here are some important travel information for Lucerne. I visited Lucerne with female friends but also by myself (and my dog) and I absolutely loved it. Lucerne is absolutely safe for solo (female) travelers and with your eyes open you should feel safe, too. 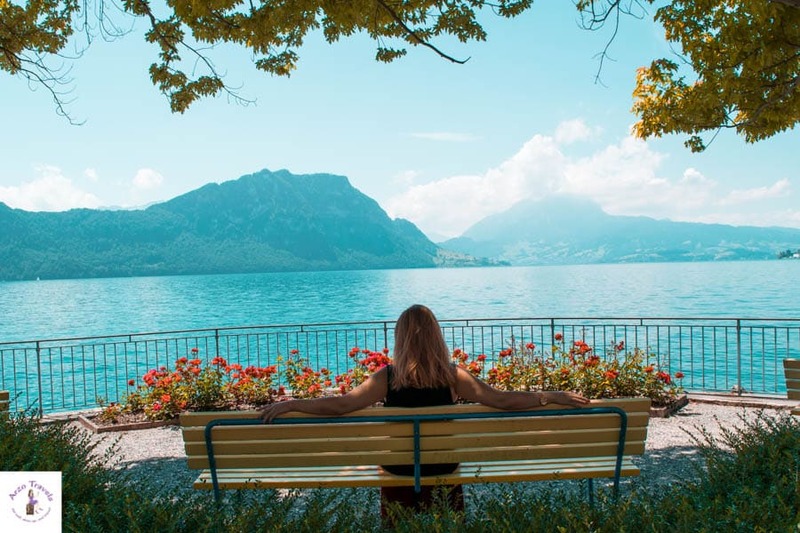 I did not have to take any precautions but tend to be a bit careful all the time – all these recommendations can be done as a solo female traveler in Lucerne without any problem. Here are some recommendations on where to stay in Lucerne Switzerland. Lucerne has a very high density of great hotels, unfortunately, accommodation is not cheap in Lucerne. Budget hotels also cost quite a fortune (at least during high-season. I have stayed in several hotels in Lucerne. $$$ Schweizerhof Luzern was probably the fanciest one I stayed at. It is a beautiful and fun 5* hotel located at the shores of Lake Lucerne and a few hundred meters from the old town and main tourist attractions. $$$ Park Hotel Vitznau This is the most expensive hotel in the region. Dogs are not allowed, so I have not had the chance to check it out. However, it looks absolutely gorgeous and is located in a very quiet area but with a view of Lake Lucerne. $$$ Park Hotel Weggis As mentioned, Weggis is one of my favorite areas in that region, so another great 5* hotel to stay is in Weggis. There is not much in that area, as even 3 or 4-star hotels cost quite a bit. If you are on a budget you can check out prices close to Lucerne. The best option is to look for Airbnb accommodation if you are on a budget. The prices are slightly better, so this might be another option. First-time Airbnb user? Save on your next stay with Airbnb and my link (Airbnb tips for first-timers are here). If you are still not sure where to stay in Lucerne you can check out my full accommodation guide on the best places to stay in Lucerne here. If you get to Lucerne by car and use the hotel parking you might get charged about 25€ a night in the city center (I was charged 60 Swiss Francs for 2 nights). There might be free parking premises in some hotels but parking is in general tricky in Lucerne. Public transportation in Lucerne is great and it gives you the chance to book a room outside the city and to get around easily. Lucerne has some really nice restaurants and as a vegetarian, it was one of the few places I always found enough options. Mostly, I get takeaway food and sit by the lake, but there are restaurants for all tastes and price ranges (p.s. no super duper cheap food though). If you get the chance to dine at Galerie Schweizerhof Lucerne restaurant. It has great views and decent prices for good food! I hope you have found the answers about Lucerne, Switzerland points of interest and I hope you have a wonderful trip and I am looking forward to hearing about your Lucerne experiences! Wondering what to do in Switzerland? Here are the tips for the 25 best things to do.